A custom webhook can pass data to just about any public API on the internet. You can use it to send a text message, update a CRM or take just about any action on a customer that you'd want to do. With a little trial and error, you should be able to connect Customer.io to another service you’re using. This guide will give you some basics to help you get started. 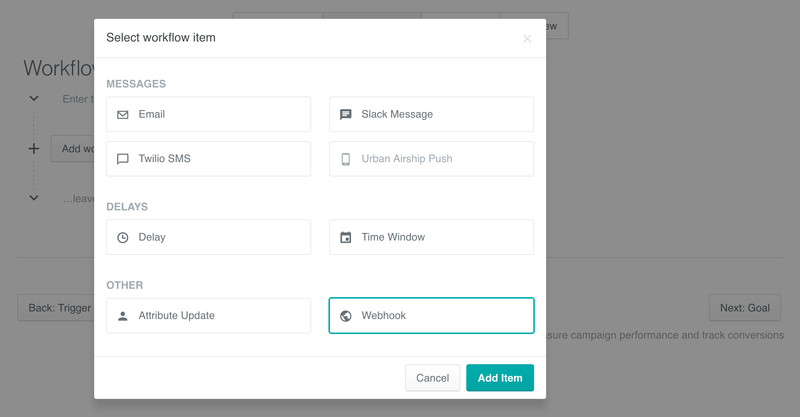 After adding a Webhook, click Add Request to go into the message composer. The one you use is dependent on what the API you’re using is expecting. Post is most likely to be used and is the default. Next to your request type you will add the request URL that you want us to send the data to. Note, we recommend working with APIs using Content-Type: application/json for readability whenever possible. If you’re using Content-Type: application/json, you’ll want to make sure you’re using fully formed JSON. That will output the entire customer object in JSON format. The downside of form encoded is that it’s a bit harder to structure and read since there are no line breaks and separation other than the "&" characters that join everything together. We have a 4 second timeout and if we get a 408, 409, 429, or 5xx response code in that period, Customer.io will retry sending the notification several times with exponential backoff. We keep retrying up to a max of 10 times over a period of approximately 7 hours. If you'd like to test the format of your requests before pointing them at the correct API, you could use a service like Webhook.site. A URL is automatically generated on Webhook.site which you then paste in to Customer.io as the request URL. If you're looking to see some real world examples, take a look at some of our recipes.